I came across something in a magazine yesterday (a magazine that had been flopped open on my living room ottoman since mid-November) and I liked it. I liked it very much. Of course, I liked it out of context but who says everything has to be in context? "...by allowing reality to rise and be acknowledged. I don't mean the reality of the backward overalls, the irritation, and the striped socks. I mean the real reality, the truth about who each of us was and what it meant to be living our lives together." The funny thing is, I liked it because I feel like the backward overalls, the irritation, and the striped socks -are- the real reality... without those quirks and turns in the road there'd be no living would there? "Prayers are not recipes or formulas; they are love poems. They need not be factual, but they must be true." I give you today's love poem. Ruth walked out of her bedroom this morning wearing these. 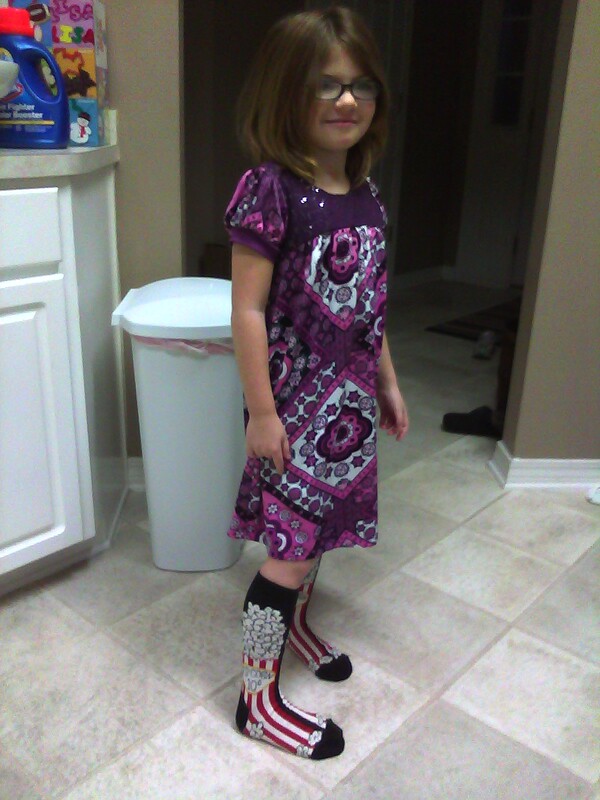 "Mom, these are my "Perfect for Thursday Socks!" Driving home from school today, Ruth sniffled. After twenty minutes of sniffling she wipes her nose with the back of her hand, her arm... (her elbow?) sighs and says, "Mom, I'm coming down with something. It's probably something I ate. Oh no! What if I'm allergic to candy canes?" Ruth appears to be deep in thought as she circles vowels in red and consonants in blue. Ruth IS deep in thought (it just has nothing to do with spelling words)! She turns to me and says, "Every day is Saturday if you're a dog UNLESS you're a working dog then I guess every day's a Monday...I'm sure Zeus and Cutie are glad they're not working dogs."